When Jella Lepman initiated the International Board on Books for Young People (IBBY), she did so for the purpose of creating a dynamic venue for the international exchange of ideas around children’s literature and literacy. 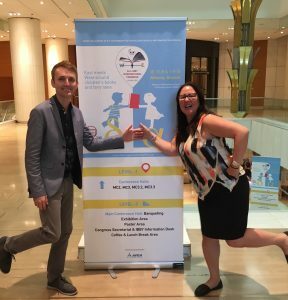 Just a day ago, I returned from the 36th IBBY International Congress in Athens, Greece where ALSC Executive Director Aimee Strittmatter and I engaged with librarians, book creators, researchers, and educators from around the globe. With a theme of “East Meets West Around Children’s Books and Fairy Tales,” the congress was an amazing opportunity to learn about numerous children’s books and literacy programs from colleagues in Asia, Europe, and beyond. 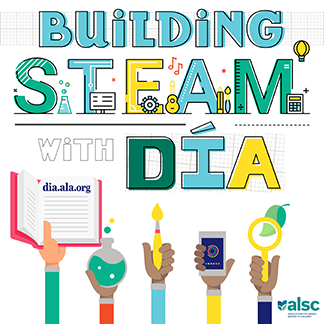 During the three-day conference, we shared a poster about ALSC’s Día initiative, describing the benefits for libraries and classrooms, numerous success stories, and plethora of online programming resources and book lists. 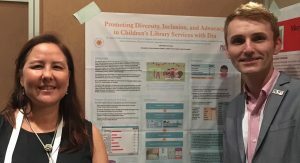 The poster, which focused on promoting diversity, inclusion, and advocacy with Día, was well received with keen interest from colleagues in Malaysia, Germany, and Italy. We were also able to meet other American literacy professionals from the field of education, and plant the Día seed to help get the initiative into more US classrooms. While in Athens we took an opportunity to explore the various libraries available to children within the city. 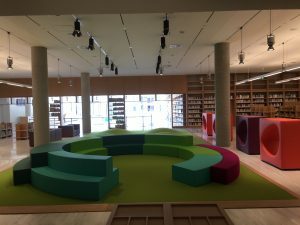 First we visited the beautiful, new National Library of Greece which will be opening its doors and collections soon to children and the ir families. 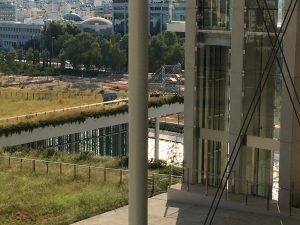 The Library’s breathtaking space, which is shared with the cultural arts center, was designed to offer opportunities for guests to enjoy the beautiful surroundings (the sea, mountain views, and the expansive rooftop garden) while also taking time to enjoy the numerous services and holdings of the library. The children’s area in this state-of-the-art green building includes a play space, video gaming cubes, board game tables, and video booths for watching educational films. Children also have the opportunity to create their own videos and music via the top-notch production rooms designed to be developmentally appropriate for their skills set. While at the Library, we received a behind-the-scenes tour from several librarians, lead by reference librarian Gregory Chrysostomidis. Later another librarian Pamela Mini shared information and statistics from the national education program that all public libraries use with children and teens during the summer months (similar to our summer reading programs). After our visit at the National Library, we met up with Ava Chalkiadaki, a board member of the City of Athens Organization of Culture, Sports & Youth and coordinator of the Municipal Libraries Committee. Ava was very generous with her time and gave us an intimate look at the two public libraries in Athens designed specifically for children. 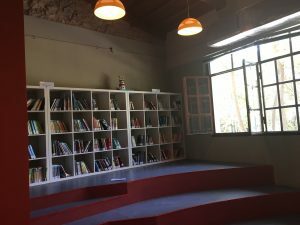 The first library was the Children’s Library of Larissa Station, founded in 2017. Located just outside the metro stop in a lower income area of municipal Athens, this library grew from a tiny, over-crowded room in the main library building at the station to a separate building with a collection of 4000+ children’s titles in Greek and other languages, and a programming area, breastfeeding and diaper changing area, and more. It is conveniently situated across a small courtyard from the adult library and next door to a preschool. The children’s librarians explained how local children were originally not very welcomed or encouraged to visit the cramped children’s room in the adult library. Through the tenacity of Ava and other library staff, and a donation from IKEA, children are now welcomed into a space created just for them. While the adult library is still in need of major renovation, the children’s library is truly an oasis for local children. Located in another part of the municipal library area, the second children’s library we visited resides in a renovated multi-use complex for youth organizations called the Park for Child and Culture. 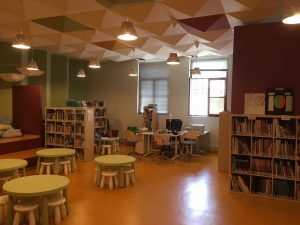 Opened in 2016, this charming library is Greece’s first library dedicated to children ages birth-6 and their families. It was developed by Ava and her library staff according to IFLA’s guidelines for library services to babies and toddlers. 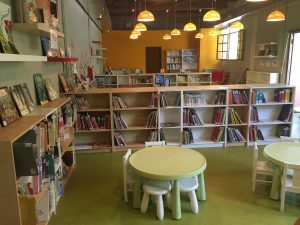 Receiving support from IKEA and the nonprofit early literacy organization Diavazontas Megalono, the beautiful library includes over 3000+ titles for young children as well as a programming space and play and feeding area for infants. Located next door and served by the same staff is the adjoining Children’s and Young Adults Library which also includes 5,000+ titles for school age children and teens.This equally delightful library was founded in 2016 and has multiple programming spaces available. Both libraries provide educational programs throughout the year and see visitors not just from Athens but from surrounding areas as well. While at this library, I made a fortuitous connection with the children’s librarian who attended the IBBY congress and shares an interest in my research on global children’s books depicting Rainbow Families. Truly, this connection represents Jella Lepman’s desire to bring children’s book enthusiasts and researchers together over books that can serve as bridges to understanding! The final children’s library that I visited in Athens was the children’s library at the National Gardens. Prior to visiting, I had been warned by local librarians that this is not a member library of the municipal libraries and not like any of the local public libraries. Although it is situated within the stunningly beautiful grounds of the gardens, this quaint library paled in comparison to the other children’s libraries. Run by an employee of the National Gardens and housed in a cottage-like building, the library has older children’s books dating 40+ years ago which do not circulate. It is not open that often and offers limited art programs for children. 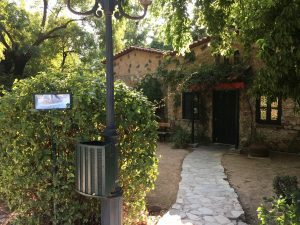 On the day I visited, I was only able to peek through the windows and hope that one day in the future it too could be revitalized and become a blossoming children’s hive of activity like the other children’s libraries in the municipality of Athens. The IBBY congress was a fabulous opportunity to make cross-cultural connections over children’s literature and literacy. I enjoyed the engagement with global librarians and scholars as well as the opportunity to explore international children’s books that we rarely see in the US. It was also quite exciting to tell other librarians and educators about Día, extolling the numerous benefits the initiative holds for celebrating cultural diversity. Equally wonderful was the unique chance to really learn about the planning and development of Athens’ libraries for children. Our meetings with the various librarians solidified that around the world, librarians face similar challenges and opportunities as we strive to provide the best services and materials for all our young patrons and their families. Tangentially related to international children’s literature and publishing, I am pleased to announce that the ALSC Board voted at the end of August to expand the criteria for books eligible for consideration for the Batchelder Award. Now books translated into English in another country and subsequently published in the US, as well as folktales (including contemporary retellings) are eligible. I look forward to the exciting possibilities this change holds for increasing the number of international books available to US children. This post addresses the following ALSC Core Competencies: III. Programming Skills, V. Outreach and Advocacy, and VII. Professionalism and Professional Development. 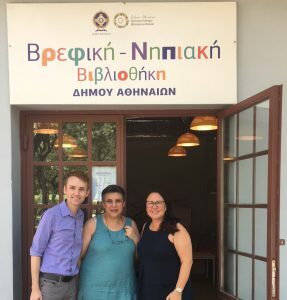 Thanks for this wonderful look at children’s libraries in Athens, Jamie, and for spreading the word about how IBBY continues to build those bridges of understanding through information sharing. Thanks too for the Batchelder update. The revised criteria should considerably expand the pool of books eligible for the award and better reflect what is available. Thank you for sharing. Really interesting to hear about children’s services in Athens. Almost made it to the conference but since I didn’t get there, I enjoyed reading your article. Sounds amazing.